"Houston, we have lift off!" 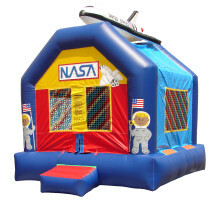 Feel the thrills of space exploration with our one-and-only Space Bounce moonwalk. You'll understand just what it was like to be Neil Armstrong and Buzz Aldrin as they leapt off the Apollo 11 and landed on the surface of the moon.